The spirit of volunteerism is alive and well in Cape Town as a group of graduates from Christel House, a school serving Cape Town’s poorest communities, are showing their gratitude by starting a mentorship programme designed to ensure that matrics at the school are given every chance of success. It’s a Saturday morning – time to kick back and relax after a week at work or studying – not so for young volunteers Xolisa Wulana and Zola Maphila. These two young people are not like most others, they have chosen to plough their time and energy back into helping others – who, like them, come from backgrounds of hardship and poverty – to get ahead. The two have set up a mentorship programme in their old school, Christel House in Ottery, that sees them and other graduates of the school taking one or two current matric pupils under their wing to help them through their final year at school. “As graduates of this amazing school, we felt we needed to do something to contribute to the Christel House circle of life. This mentorship programme is our way of giving back”, said Xolisa. Xolisa, who has a BCom from the University of the Western Cape (UWC) and is being sponsored by Accenture to pursue his Honours degree in Information Systems, recalls how when he walked through the gates of Christel House in 2002 as a shy seven-year old boy, he didn’t realise that his life was about to change. “Coming from a township like Langa, where a child is more likely to do drugs and go to prison than to finish school, Christel House saved me and gave me the best possible education. Everything I am today is because of the strong values Christel House taught me,” says Wulana. He and his fellow graduates now want to reinvest some of that social capital by providing advice and support to the current matrics in the school. Aside from one-on-one meetings with mentees, the group also arranges get-togethers with all mentors and mentees on a regular basis. And to help them brush up their mentoring skills, Christel House CEO, Nicky Sheridan, arranged for a Life Coach, Dale Williams, to spend a morning equipping them with the tools necessary to listen carefully and provide advice wisely. “I meet with my mentees in a personal capacity twice a month, and in order to keep all communication channels open between us, I’ve made myself available to them on e-mail and on social media platforms. I want to be accessible to them as much as possible”, says Xolisa. According to Zola, who also began her Christel House journey in 2002 when the school was first established, it is becoming increasingly important for young people to form these mentor-mentee relationships, particularly those who live in townships like Langa; where they are forced to face down the relentless social demons of gangsterism, violence, prostitution and drug abuse. Christel House aims to break the cycle of poverty by providing children with free, quality education in a stable environment. Children are not selected based on academic merit, but solely on financial need. The school maintains a rigorous academic programme, which is complemented by transport to-and-from school, nutritious meals, medical and psychological support as well as career guidance. According to Zola, it is this holistic approach to education that sets the school apart, and ultimately sets a Christel House graduate apart. Because of this focus on employability, the mentorship programme works closely with the existing College & Careers (C&C) department at Christel House, which is designed to assist students in making informed career and educational decisions. Amanda Nodada, who is also a graduate of the school and holds a BCom degree in Information Systems, now works as the C&C operator at the school, and is instrumental in making sure the Grade 12s have set activities for the year, including job shadowing at reputable companies like KPMG and Oracle SA, attending open days, taking an online career and personality test and preparing them for an intensive one-on-one interview with Sheridan. 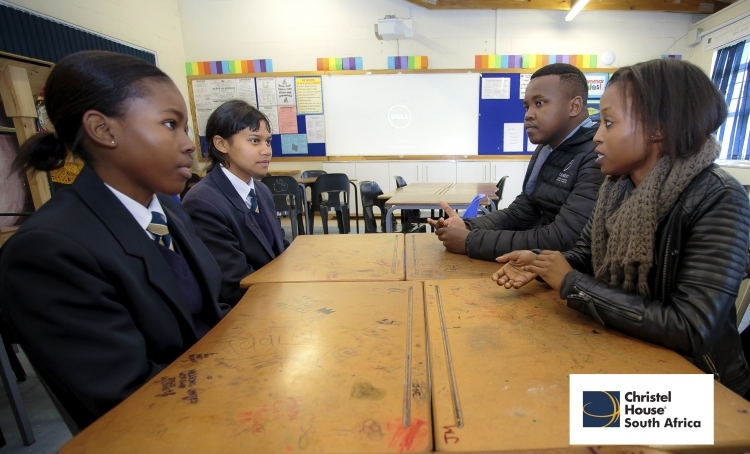 One of the objectives of the mentorship programme is that the current matric pupils will in turn become mentors to next year’s matrics, thereby creating a support network that will continue to grow for many years to come and enrich all participants. Many studies now attest that volunteerism holds a number of key benefits for individuals, businesses and government. Apart from the economic gain, it also increases the volunteer’s overall wellbeing by boosting their confidence, reducing stress and teaching them new skills. “We all have the power to be change agents; but only if we are willing to do our part. The beauty of it is, you don’t need to have money, you don’t need to have a degree, or anything like it. You just have to have heart and the willingness to give,” concludes Zola.